A SpaceX Falcon 9 rocket was prepped for for a pre-dawn launch Friday to carry nearly 6,000 pounds of equipment, supplies and science gear to the International Space Station. Its payload includes a basketball-size robot using IBM's Watson artificial intelligence technology that will act as an astronaut assistant. Liftoff from pad 40 at the Cape Canaveral Air Force Station is targeted for 5:42 a.m. EDT (GMT-4), roughly the moment Earth's rotation carries the pad into the plane of the space station's orbit -- a requirement for such rendezvous missions. This will be SpaceX's 12th flight so far this year and its third for NASA featuring a previously flown first stage, used to launch the agency's planet-hunting TESS satellite in April, and a "used" Dragon cargo ship that flew to the space station in 2016. The first stage is the last "block 4" model in SpaceX's inventory. The block 4 version was not designed to fly more than twice and SpaceX said no attempt would be made to recover the booster after launch. But after this flight, SpaceX will switch to upgraded block 5s that are designed for 50 or more flights each. 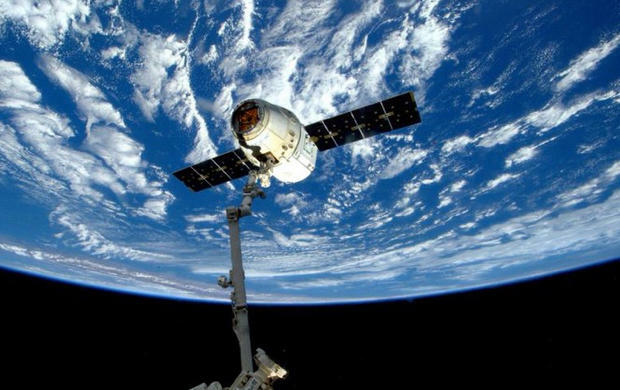 "From the get-go, SpaceX has set out to make spaceflight more like commercial air travel," said Jessica Jensen, manager of Space's Dragon program in Florida. "We want to make it safe, affordable and utilizing vehicles that can be reflown repeatedly. "This is the key to the future of a civilization where we have thousands to millions of people exploring the stars and living out on other planets. Tomorrow's mission (is) one small step toward that goal." Assuming an on-time launch, the Dragon cargo ship will reach the International Space Station early Monday. Its pressurized cabin, the section accessible by the crew, is packed with more than 3,770 pounds of equipment and supplies. An environmental research instrument and a spare latching end effector, or "hand," for the station's robot arm are loaded in an unpressurized trunk section. They will be pulled out later and mounted on the station's exterior.